How do I change the theme or view style of SQL-RD? You can select from a number of themes, colors & viewing styles from the Home menu of SQL-RD. 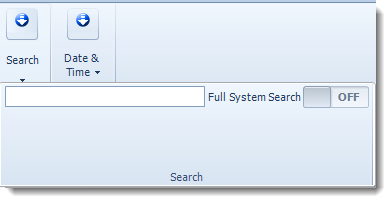 You can also perform a system search and refresh the home screen from this ribbon section. SQL-RD Outlook is an interface in SQL-RD that allows you to view your schedules in several different ways. The SQL-RD Outlook view is divided into left and right panes. The left pane contains options and controls which affect the view that is presented in the main viewing pane on the right. 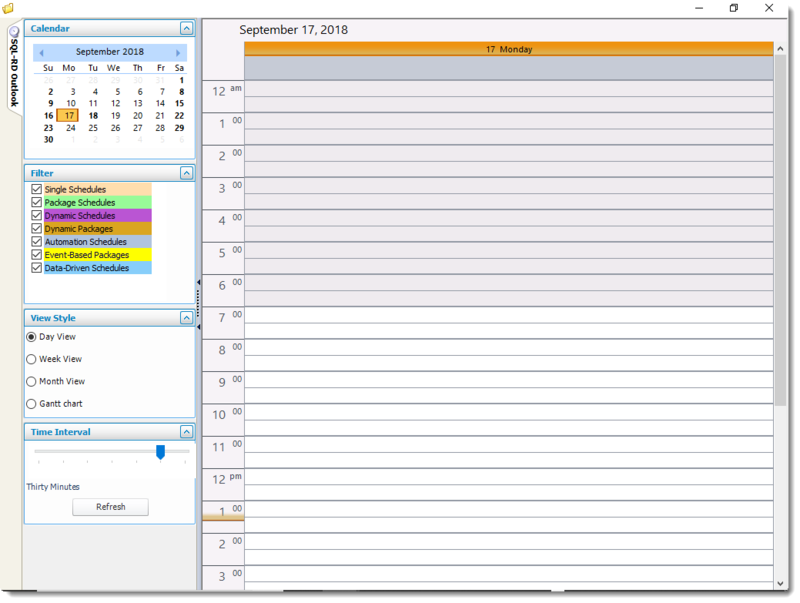 The first section in the left pane is the Calendar section. This allows you to navigate to any desired date by clicking on the date. A selected date has its background grayed and the current date is highlighted with a red border. Selecting a range of dates in the calendar item displays that range in the right hand pane with the selected view style. You can move through the months and eventually years by clicking on the left and right buttons on <Month> <Year> display area or click any greyed out dates for the next or previous month. You can collapse and expand the Calendar or any section by clicking the arrow toggle in the top right hand corner of the section. The Filter section allows you to select the types of schedules for which information will be presented in the main viewing pane. For example, the selection shown in the figure above will mean the current view on the right will present information on all types of schedules that are available. 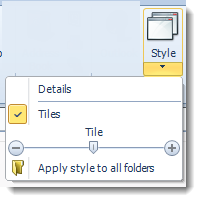 The view style allows you to change the view that is presented in the viewing pane on the right. This shows you information on schedules for the hours between 12:00am and 11:59pm for the day that you have selected in the Calendar section. You can select a schedule and move it to change the scheduled times. This shows you information on schedules that fall in the week that contains the day you have selected in the Calendar tool. The Current day if it is in this week is highlighted in orange. The Month view shows by default the information on selected schedules for the current month. You can also scroll through to other months in this view in a 2 year range. 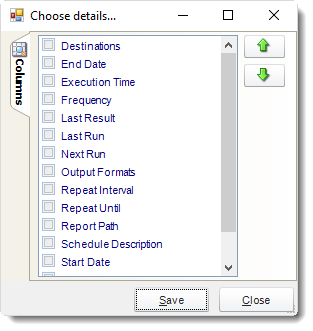 The Gantt view allows you to view the schedules in a Gantt chart which you can further modify using the options below the chart. You can use the time interval section while in the Day view to view schedule with the desired granularity. The time interval ranges from 5 minutes to one hour. Click Refresh to apply the selected interval to the view. Switch between list view and tile view for your schedules. Use the sliding bar to adjust the level of detail displayed for each schedule. Check the properties you would like to see when using Detail view. Use the arrows to determine the order the columns will be shown. Refresh the screen to show the latest schedule information. Select the color scheme for SQL-RD. Pick the one that best fits your tastes. Use search to find a specific schedule. Tip: Search looks for a schedule in the highlighted folder. to search all schedules, create a Smart Folder that encompasses every schedule, then use search to find the schedule.